Me givin' my puppy stuffie hugs! Those look a little small....how about two?? Oh, right, this is abouts HUGS! Why is everyone running away......guys! and lots of slobbery kisses! Love your puppy selfie picture, very sweet. We hope you got more than just two treats for all those wonderful hugs with your stuffie!!! Great job on sending even more hugs to The Three Little Pugs. They have received so much love from all the hugs all over the world. 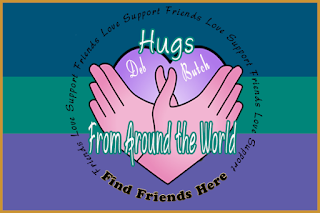 Thanks for sharing your fantastic hugs with everyone today. We will take one and give a big one back! We will take a hug Ruby!!! Wait, did I read somefin bout cookies and margaritas?? Fank you for those wonderful slobbery hugs, they make us feel 100% better!!!! Margarita hugs....the best in the whole world! Well don, girl. Cute hugs Ruby!! They are getting lots today!! Ruby, I bet you give the best hugs. I know that Deb, Butch, and the pugs feel better now knowing so many care about them. This has been an amazing day seeing all the bloggers responding to this good cause. What a good and caring place Blogville is! We bet your sloppy kisses will be the healing juice Butch needs. BOL! These are the best huggs of all! I'm not running away, Ruby. I'd love one of your hugs! Great photos of hugs (and slip up about margaritas!). I want one I want one! I don't even care about the slobber, I like it. I am sending you a hug right now, so hang on cause here it..................commmmmmmmmmmmmmmmmmes!!!!!!!!!!! Us Boyz are stand in line for hugs...wellll, if Murphy doesn't mind that is!! We just love how Blogville hugs together for great causes! I want a hug, slobber is pawsome :o) and so much hugs are worth a margarita or two, right?